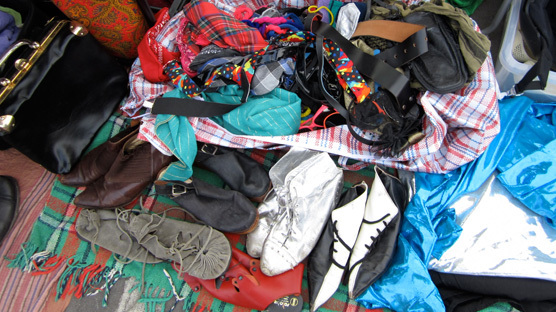 There are two types of trader at a boot fair – a Casual and the Professional. Who's who? And how can they work for you? 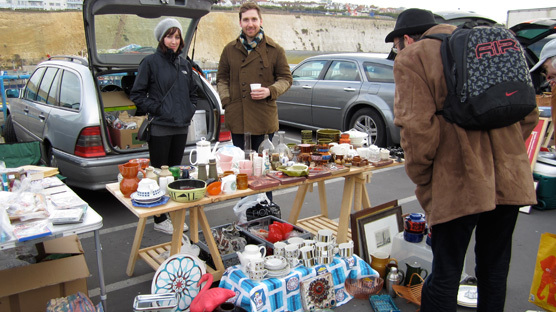 Ce Ce and Mo Mo were first timers at Brighton Car Boot Sale. The Casual is a person having a genuine clear out of their own belongings. They’re probably moving, redecorating, need to raise some cashola and so on. The Casual stall is more than likely quite chaotic and full of mostly modern items. However, now and again you’ll find a real interesting Casual and you have to beat the Professional to their pitch! I met Ce Ce and Mo Mo at the Brighton Marina car boot sale and they were destashing their lives before a move to New York to study performance and visual arts. Shoe fetish? Walk this way! The super colourful stall had their personality stamped all over it. I felt like I was peeking inside Bishi’s dressing up box. From a Roland keyboard to an Ungaro pill box ribbon bag – it’s just a shame the harlequin tops, two tone pixie boots & sequin hot pants were just a little bit too worn. The point is a Casual stall is very hit and miss and you’ll have to spend time digging through market stall bags and boxes in the hope that the Professional hasn’t already been before you. Find a good ‘un at the right time and that’s when you’ll unearth that hot-to-trot vintage bargain! So if you’re time rich & cash poor (and don’t mind a super early start) get yourself down to the boot fair with the lark and seek out the Casual. Ed and Sarah hope to Pop-Up in a Brighton shop one day soon. The Professional is a reseller of other people’s second hand stuff and makes a living from it. They might do house clearances, go to auctions, buy from out of town boot fairs and bring to city centre fairs. They were most certainly the first folk to show up at the boot sale that day and have probably already done the rounds buying from the Casuals before sunrise. The Professionals are great because they have a good eye and have done the hard work for you! 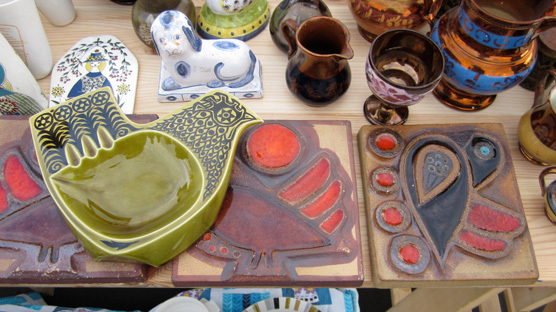 If you go to a boot fair like Brighton Marina that has a large proportion of Professionals you can most certainly have a lovely lie in and then mosey on down and go straight to these stalls for a good selection of quality vintage pieces. I also met Ed and Sarah at the Brighton Marina and they had an amazing selection of beautifully displayed homewares. Beautiful 1960’s Noomi Backhausen wall tiles. In the true spirit of a Professional when I first found their stall Sarah told me Ed was looking round the fair – probably seeking out the good stuff from Casuals. Upon his return, Ed picked out a set of 1960’s Noomi Backhausen tiles as his favourite items for sale. He spoke very passionately about his stock and if I were a local looking for homewares I would most certainly be on the look out for this stall. The good thing about Professionals is they do the boot fairs on a regular basis and if you build up a relationship with them they will probably seek out stuff specifically for you. So, if you’re short on time and don’t mind spending a little bit extra (remember it still won’t be as much as buying from a bricks and mortar shop) then get to know the Professionals at your local fairs. So, I do love a Casual and I also love the Professional! Infact, the best car boot sale has a good proportion of both with NO sellers of new goods like cheap toiletries & batteries. What’s that all about? Haha I love the last bit Leona about the toiletries! so true! xo ps. You haven’t got any dial phones stashed away have you?